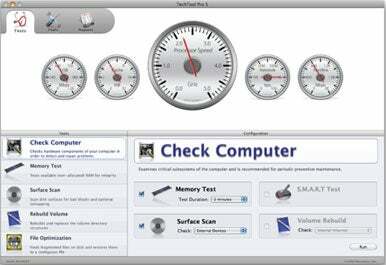 Last year, I wrote about a Macworld Expo preview of TechTool Pro 5, which was in active development at the time. Although no release date was given at last year’s show, I’ll admit I was expecting it wouldn’t be more than three to six months before the program was released. The reality, though, is that TechTool Pro 5 is finally beginning to ship. Based on a short visit with Micromat this week, this latest version of the venerable problem-solving utility sports a brand new interface, and a lot of new features. Unfortunately, the EFI memory tests I wrote about in last year’s preview are not one of those new features. So what is new? Beyond the new interface, you can now identify files that reside on bad blocks, you can see a trash history to help recover deleted files, you can check for specific types of file corruption, and set up an automatic monitoring system to watch the free space on your disk drives. A new interface when running all tests shows you all the queued up tests, and you can selectively disable those tests you don’t wish to run, even after you’ve started the (lengthy) process of running all the tests. All these new features are on top of the program’s existing capabilities, including disk defragmentation, data recovery, and testing and repairing hard drives. The new interface is a great improvement over the old, and the new features add even more power to this troubleshooting and maintenance tool.